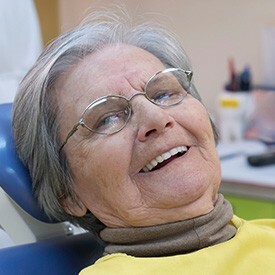 Dentures are used to restore oral health for patients who’ve experienced extensive tooth loss – numerous consecutive teeth or a full row of teeth. At La Plata Dental, we offer high quality, durable, natural looking and feeling dentures to renew oral health and give our patients the ability to smile with complete confidence. If you’re in need of a partial or full denture, please don’t hesitate to contact our La Plata dentist and team to schedule a tooth replacement consultation. Partial dentures are crafted to fill in the gaps between patients’ teeth. Both partial and full dentures are created by using a custom crafted base material to support numerous replacement teeth. The gum-colored base material of the partial is formed to fit between remaining healthy teeth. Metal clasps attach the denture to these healthy teeth restoring the natural shape and function of the smile. Full dentures are available in two forms - conventional and immediate. Conventional dentures are created once all the teeth are removed and the gum tissue has healed. This ensures a perfect, comfortable fit, but may leave you without teeth for an extended time. Immediate dentures ensure you’re never without your smile, but they will likely need to be refitted once your gums have fully healed. Both options rely on suction between the denture and the gum line to keep the prosthetic in place, so a snug fit is essential. Every patient and every treatment plan are unique. When you schedule a tooth replacement consultation, we’ll examine your current state of oral health. Then, we’ll give you recommendations for how to best repair your damaged smile. 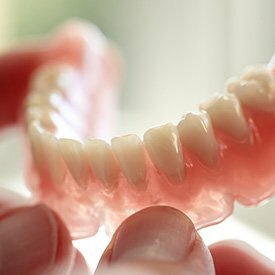 If you’d like a more stable, longer lasting denture, we also offer dental implant supported prosthetics.